Toddler Activities: Keep those broken crayons and recycle them by turning them into fun Rainbow Crayons! Great for keeping toddlers occupied at restaurants, party favors or drawing neat pictures. 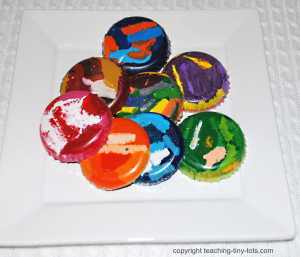 Save those broken crayons...make rainbow crayons that your toddler will be excited to color with. It is also a great party favor. Break into thirds or fourths if not broken already. Sort into muffin tins. I like about 2 layers of crayon although a single layer works too. Place in toaster oven or oven at 200 for approximately 10 minutes or until melted. Wax CAN burn so you need to know your oven. If your oven runs hot reduce heat to 170 and lengthen time to 15 minutes. I stirred a few with a skewer to get different results. Remove from oven. Let cool and pop out of tin. Obviously the oven portion is all done by an adult but the sorting of the crayons into tins are a great color activity for your child. Sort by shades or by primary colors to get secondary colors or make a complete rainbow. Use only tins or small containers appropriate for heating in the oven. Make sure you use only your "craft designated tins." 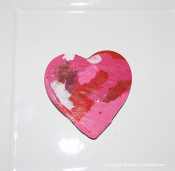 Cookie cutters are NOT recommended because crayon will seep from under the cutter. NOTE: Brand does matter! If the crayons are waxy and don't color well to begin with, it will make a poor quality rainbow crayon. We like Crayola. Take a minute to talk about recycling and living green with your child. This activitiy is a great example of how new things can be made from old things. 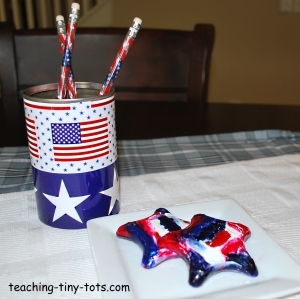 Use different shape tins or molds to get fun shapes for holidays. 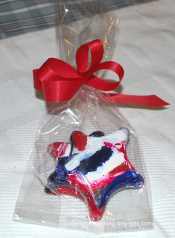 Great as party favors or for entertaining children at a party. Leave a few on each table with some paper. See above for instructions. This rectangular crayon on the right was made using a mini loaf pan. We broke it into smaller pieces to use. This worked well for crayon rubbing activities. Great opportunity to discuss colors and different shades while sorting colors.